by Enrico Baccarini© – Vimanas are described in ancient Indian literature as the ‘chariots of the gods’, a sort of technological vehicles similar to modern one but also able to have much more incredible powers in confront to our airplanes. Behind all these ‘literary’ description there is something more, exist a real technological background lost in the time but also passed throughout ages as an oral tradition. We have founded some quotations from classical Sanskrit literature, verses we had chosen specifically to illustrate the visual appearance, nature and capabilities generally ascribed to these ancient fabulous vehicles known. “Causing the heaven and the earth to be filled by a loud sound, then Indra came to Yudhishthira on a car and asked him to ascend it. 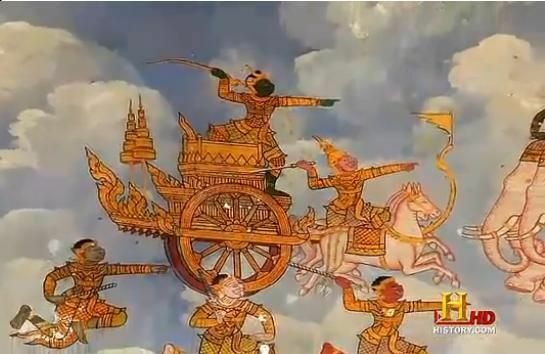 In both the Mahabharata and the Ramayana the researcher encounters the rather puzzling use of “steeds” and “wheels” (necessary componants of the conventional ground-bound war chariot). But why use such terminology when describing aerial vehicles? At first, this was a little baffling—after all, flying asses yoked to an airship? Let me draw attention to the phrase “propellers furnished with wheels, working with atmospheric expansion.” This is the way a modern jet engine works: pulling in fresh air using impeller blades, expanding the air by heating it, then directing it through more blades, which turn a shaft connected to the forward turbines, which packs in more air. If we substitute “impellers” for propellers and “turbines” for wheels—both more modern terms—it begins to make a great deal of sense. Ancient drawings of these machines actually portray turbines and expansion chambers similar in some ways to our modern jet engines. So, at this point let me suggest that in many cases the Sanskrit word chakra should be translated “turbine” rather than “wheel,” without doing violence to the Sanskrit. 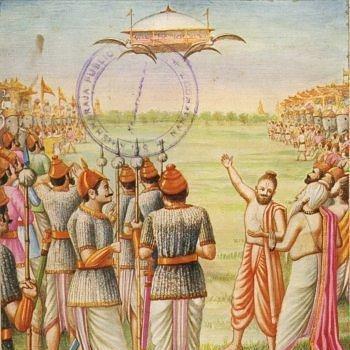 The ancient Aryans of India tended to allegorize a lot, making it difficult to look at their propulsion systems from our scientific point of view. 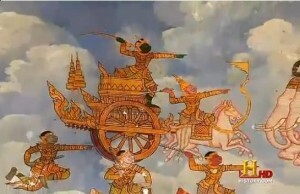 Often the vimanas were said to be drawn through the sky by “celestial steeds” (whether horses, swans, asses, or elephants). What means this? *This is always the case in P. C. Roy’s translation of the Mahabharata (i.e., if a passage contains the word “vimana,” it is from one of the alternate sources listed in the bibliography below). All excerpts from the Ramayana are from Manatha Nath Dutt’s translation (who uses the term “vimana”). The Puranas are from Dr. Richard L. Thompson’s work “Alien Identities”. Childress, David H., “Vimana Aircraft of ancient India and Atlantis,” Adventures Unlimited, Stelle, IL, 1991. Dikshitar, V. R. Ramachandra, “War in Ancient India”, Motilal Banarsidass, Madras, 1944. Josyer, G. R., “Sanskrit Civilization,” International Academy of Sanskrit Research, Coronation Press, Mysore, 1966. Kanjilal, Dileep K., “Vimanas in Ancient India,” Sanskrit Pustak Bhandar, Calcutta, 1985. Nathan, Kanishk, “UFOs and India: Ancient and Contemporary,” UFO Symposium Proceedings, MUFON, 1987. Raghaven, V., “Yantras or Mechanical Contrivances in Ancient India,” Transaction No. 10, Bangalore, 1956. Roy, Protap Chandra (translator), Mahabharata, Bharata Press, Calcutta, 1889. Smith, Ruth, Mahabharata in “The Tree of Life,” Viking Press, New York, 1957. Thompson, Richard L., “Alien Identities,” Govardhan Hill Publ., Alachua, FL, 1993.
i want Maharishi Bhardwej Vimana Sastra in (sakrit&Hindi). I need to learn how to make viman and everything.